Archetypes appear in a variety of places throughout the various Dark Eye sourcebooks. They can be useful for pick-up games, character construction guides, and NPCs. And of course, the Aventuria Compendium contains a number of them that highlight the new rules. A farmer’s life is difficult and monotonous, which might be why nearly every farmer’s child dreams of being an adventurer. Whether to escape poverty, seek adventure, or flee an angry mob, the Albernian farmer made this decision and set off without knowing much of the world and its dangers, trusting only to luck to carry the day. He is by no means stupid, but a bit of naivete influences his decisions. Although he knows how to till the fields and raise livestock, he has no grasp of life in the city or courtly intrigues. 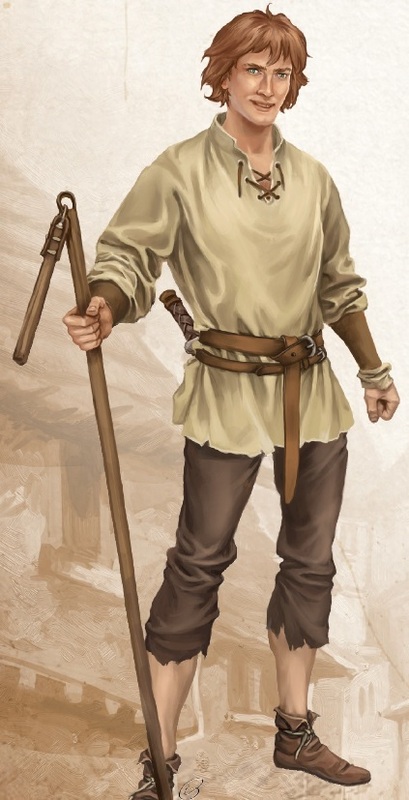 As a man of action, the farmer can pitch in on manual labor, has a passable knowledge of healing herbs that grow near planted fields, and understands the worries of the common folk, which is why they would rather talk to him than to a noble. He is a born hero, but still must prove himself to be one. The farmer’s Skills and Special Abilities are very focused on agriculture, animal husbandry, and plant lore. He is a boon to any party that has to survive in the wild, and he is strong and healthy. He is, however, not very skilled at the more martial side of combat, and he is likely to feel lost in any kind of urban environment, or even in a rural area far from his home. But there are plenty of stories about the farmer who went off and discovered the world (or worlds). If you want to tell that kind of story – or many other stories – the Aventuria Compendium is for you!